Elizabeth Nourse knew what it was like to be a woman who was completely dependent on her own work. Her father and mother had died within a year of each other when she was still quite young and Nourse had to support herself and her twin sister after that. She continued to do so for the next 55 years of her life. Perhaps this is why she was so drawn to the working-class women she met while traveling through Europe and Northern Africa. 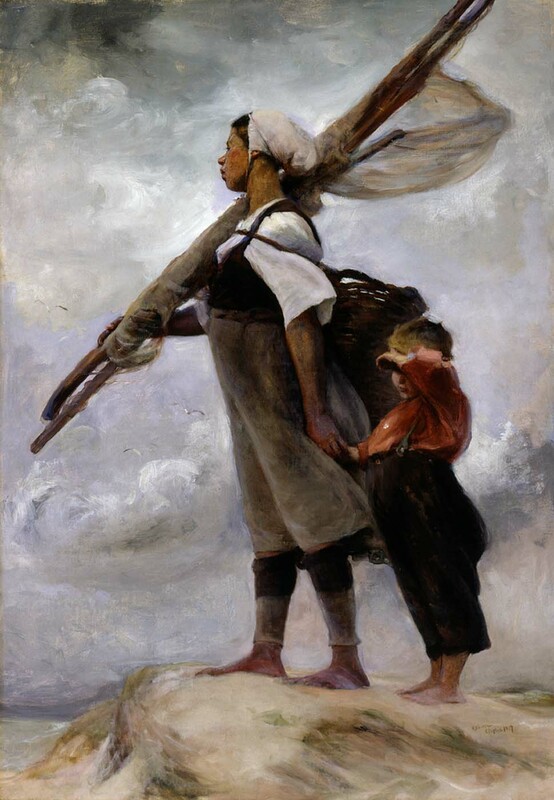 Fisher Girl of Picardy was painted just two years after Nourse landed in Paris in 1877. Back in America, she had enjoyed painting rural folk in the Midwest and working women, especially African American women. Then across the Atlantic, she was completely taken with the French peasant women. This scene depicts the Etaples Dunes in northern France. She enjoyed painting ‘en plein air,’ which is just a fancy phrase for painting outdoors. Therefore she actually had a model stand on the dunes buffeted by the ocean air while she painted. Nourse’s friend who accompanied her on the trip remarked that the day was so cold and windy that the model began to cry. If anything the subject’s frown and red, raw skin depict an accurate picture of just how soul-crushingly awful being a fisherman/woman was in the 1800s. The workday was extremely long: sail to the fishing grounds at or before dawn, fish until the boat was full (hopefully), sail back and then begin removing the head, cutting out the backbone, salting and drying the fish. On top of that, fishermen needed to catch bait every single day. No skipping bait day. Women performed most of the ‘shore work’ which included the cutting and curing process. It was highly physical work out in the elements that took up most hours of the day, every day and left little to no free time. Add in needing to watch your kids while simultaneously hacking off fish heads, ‘cus who are we kidding the men aren’t going to watch them, and you have literally just described my living hell.